Project Description: Make your own festive holiday cards with Grafix Funky Film. 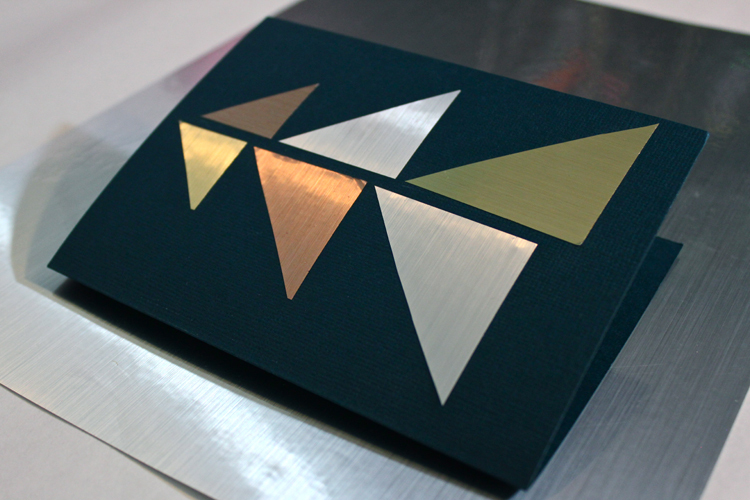 Cut 3 sets of triangles from Silver Brush, Gold Brush and Copper Brush Funky Film. (You could also cut squares in half diagonally from corner to corner to create perfect triangles.) The first pair of triangles should be about an inch tall, the second pair will be an inch and a half, and the third will be two inches. Stagger triangles to mimic a tree truck. Make the right side slightly lower than the left and leave a 1/4 inch gap between the triangles.